Burmese opposition leader Aung San Suu Kyi will take her election battle straight to one of the president’s closest allies as campaigning gets under way. RANGOON — Burmese opposition leader Aung San Suu Kyi will take her election battle straight to one of the president’s closest allies when campaigning gets under way this week for the first free general election since the end of military rule. Nobel laureate Suu Kyi will meet her supporters on Thursday in Karenni State, a region where powerful President’s Office Minister Soe Thein, the architect of President Thein Sein’s economic reforms, is running for a seat in the Nov. 8 election. Her appearance is a gesture of confidence that her National League for Democracy (NLD) can defeat the president’s closest supporters and their ruling, army-backed Union Solidarity and Development Party (USDP). The campaign officially begins on Tuesday. The NLD is expected to win the historic poll, which marks a major shift in Burma’s political landscape, giving the platform to democratic activists shut out of public life during nearly half a century of strict military rule that ended in 2011. Since then, the country’s semi-civilian government has implemented reforms, released hundreds of political prisoners and opened Burma to investment. “The elections are poised to be the most credible since the 1950s and that’s significant,” said Richard Horsey, an independent political analyst and a former UN official in Burma. “If the NLD, as expected, becomes the largest party, there will be huge expectations that would be difficult for any party to meet,” he said. The campaign begins less than a month after a major presidential contender and opponent of Thein Sein, powerful parliamentary speaker Shwe Mann, was removed as ruling party leader in a dramatic shake-up of the political establishment. Shwe Mann’s close relationship with Suu Kyi was regarded with suspicion by the military, a warning perhaps that the generals and their conservative allies will resist any bid to push them from power even if the opposition wins big. Parties are banned from criticizing the military or the junta-drafted Constitution in campaign speeches in state media. The ballot will determine representatives of the bicameral Parliament and regional chambers for five-year terms. The Upper and Lower houses will both nominate a presidential candidate, who must secure the support of a majority of members, and the military—which under the junta-drafted Constitution holds a quarter of the seats—will nominate a third. Parliament will then vote on which of the three candidates will be president and the president will form the government. “It’s really the president and the president’s administration, rather than the biggest party in Parliament, that determines what happens next in the reform process,” said Horsey. The Constitution bars Suu Kyi from becoming president, even if the NLD wins a majority, and it also gives the army a veto over constitutional change. The NLD’s power in Parliament will depend on whether it has enough members to nominate a presidential candidate on its own. With few credible opinion polls in the impoverished country, that is unclear. Suu Kyi has said her party will put forward a “suitable” presidential nominee. She has declined to elaborate. The USDP, which is dominated by military and civil servants who retired to become candidates, will be the NLD’s biggest opponent. The last general election was held under military rule in 2010 and widely condemned as rigged in favor of the USDP, which includes remnants of the old regime and business allies, and it is expected to lose a significant number of seats. Suu Kyi was under house arrest at the time of 2010 vote and her party did not take part, but she was released six days later. The NLD agreed to join the quasi-civilian system in 2012 and later won 43 seats in parliament in by-elections. 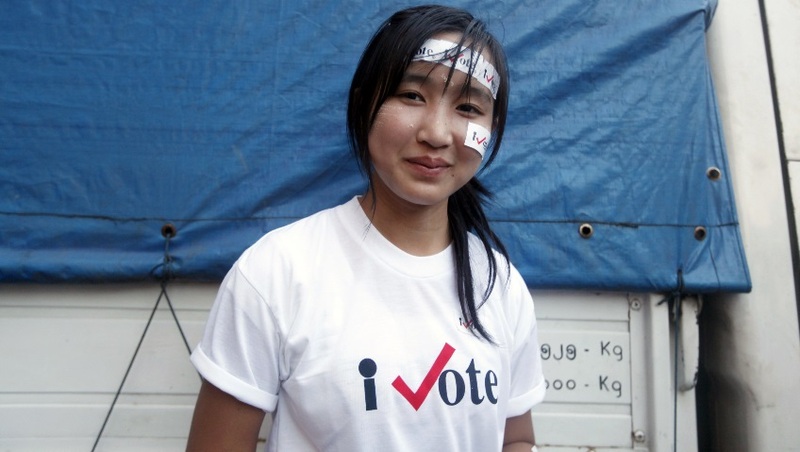 A woman smiles in Rangoon on Nov. 5, 2010, as she takes part in an ‘I Vote’ campaign for Burma’s 2010 general election. Suu Kyi is standing in the constituency of Kawhmu, a southern delta town outside the biggest city, Rangoon. “We are going to aggressively target the constituencies with big-ticket candidates from the ruling camp,” said Win Htein, a senior NLD member who is coordinating its campaign. Win Htein said the party would focus on four main areas, including the amendment of the Constitution and a peace process with ethnic minority armed groups. “We will also work to create a non-corruptible government and on national reconciliation—because we’re dealing with the army,” said Win Htein. Several issues are casting a shadow over the election including the cancellation of temporary citizenship documents that had allowed members of the Rohingya Muslim minority to vote in previous elections. Many parties, mindful of the growing influence of conservative Buddhists across the country did not file Muslim candidates, observers say. Top Photo - (Reuters) A candidate’s poster for Burma’s last general election is seen at a market in central Rangoon on Nov. 5, 2010.